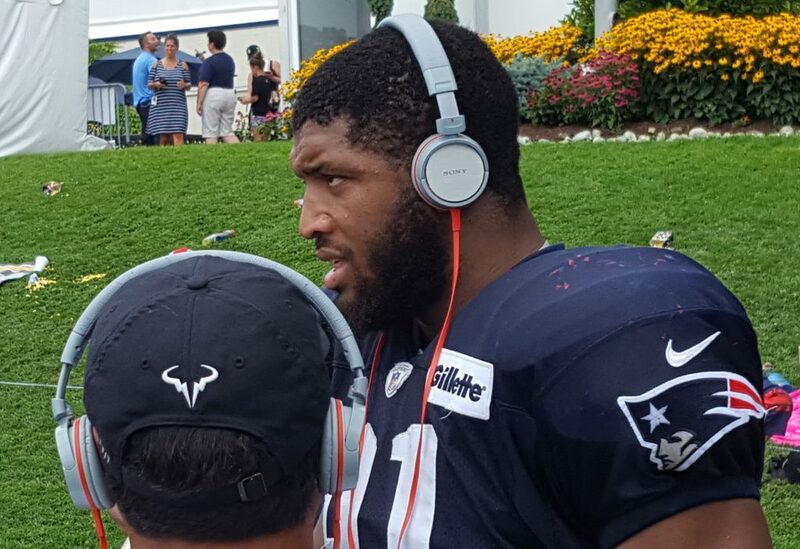 Good morning, here are your Sunday’s Patriots news 8-6, & AFC East Notes. 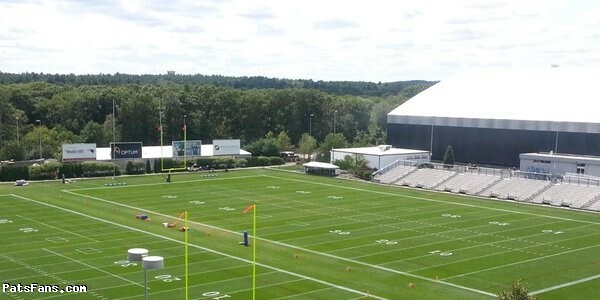 The Patriots have the first week + of camp in the books, the team will have today off as they prepare for the joint practices with the Jacksonville Jaguars that begins tomorrow morning. 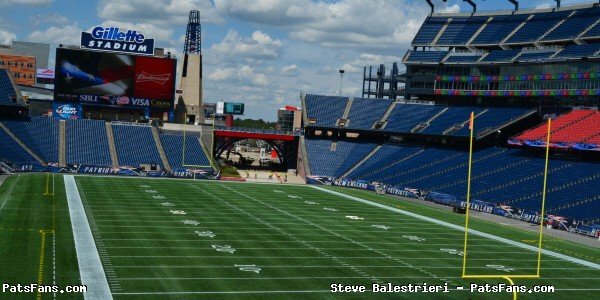 The two teams will open their preseason schedules on Thursday night with a game at Gillette Stadium. We will be looking forward to the two teams getting some good work in this week. It is always a valuable tool for the coaches and players to practice against someone else after going against just your teammates all spring and thru the first week or so of training camp. The Patriots got a healthy Rob Gronkowski back for training camp this season and although the team is limiting his reps a bit, he’s fully healthy and ready to go this summer. 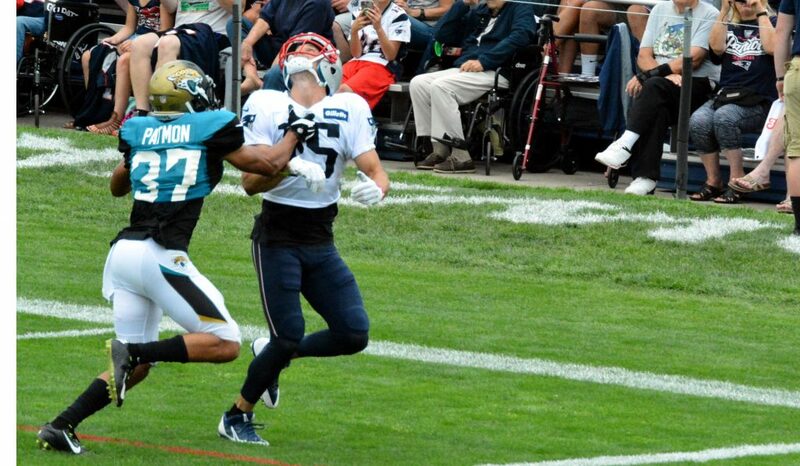 Gronkowski and Bill Belichick earlier during training camp both said that Gronkowski is under no limitations whatsoever, which is great news for the offense this year. The big man was limited to just eight games a year ago and none during the Patriots Super Bowl run. Having a healthy Gronkowski for the 2017 season with the stacked wide receiver group and running back options in the passing game makes the Patriots offense an even more dangerous one than averaged over 30 points per game in the playoffs last year. He looks to be his normal, athletic self at tight end so far and is a load for any safety to cover and is a mismatch against any linebacker. Tom Brady also has one of his two most trusted receivers in the passing game. 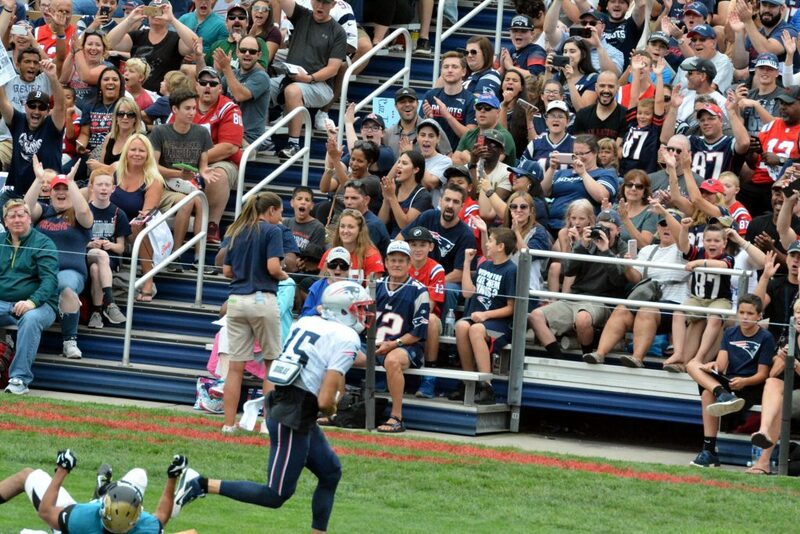 Gronkowski still has that exuberance for the game, even in training camp that brings out the kid in all of us. He takes great delight in scoring touchdowns even in practice and even when he makes a mistake, he makes the most out of it. Yesterday he jumped offside and get going and looked like his penalty lap was still fun while most guys act like they’re going to the gallows. The Patriots picked up Rex Burkhead this spring and on the surface, the move made very good sense. Burkhead is a valued special teams’ performer and was a productive backup running back for the Bengals. But in New England the 27-year old looks to have a much larger role. He has the ability to run between the tackles and is showing a nice knack for finding open real estate in the passing game. This versatility with his ability to run or catch is something the team lacked last year. When James White was in the game, opponents knew they would probably pass. When LeGarrette Blount was on the field, it was considered a run. Now they can keep opponents guessing. 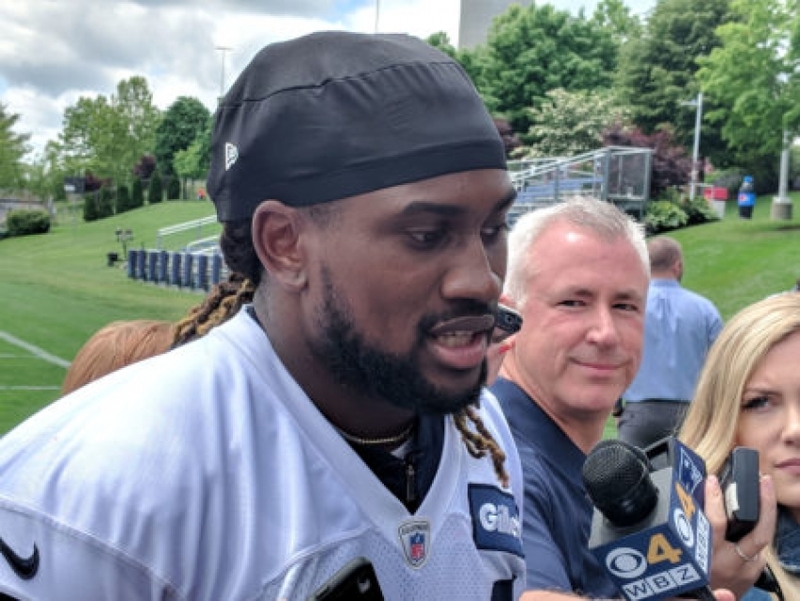 With a return of health of Dion Lewis and Mike Gillislee handling the majority of short yardage situations, the team is in a good position to keep things mixed up. 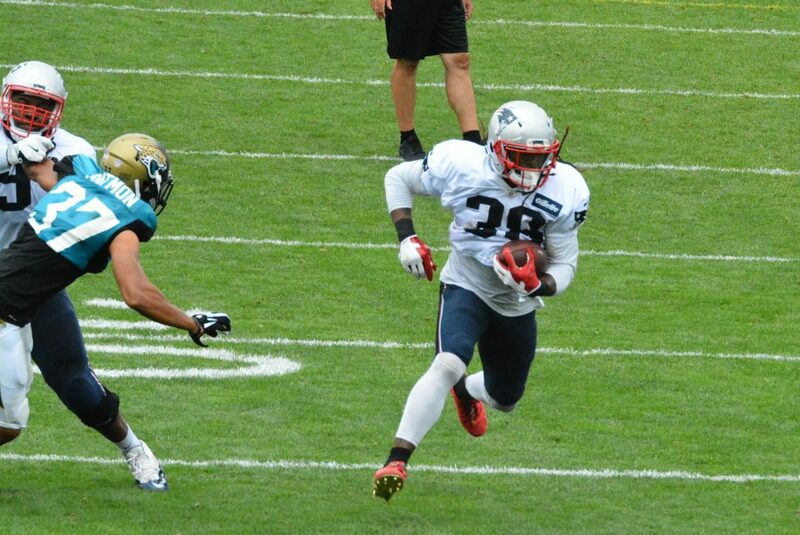 And Burkhead thus far looks to be much more than a backup and a STs player. 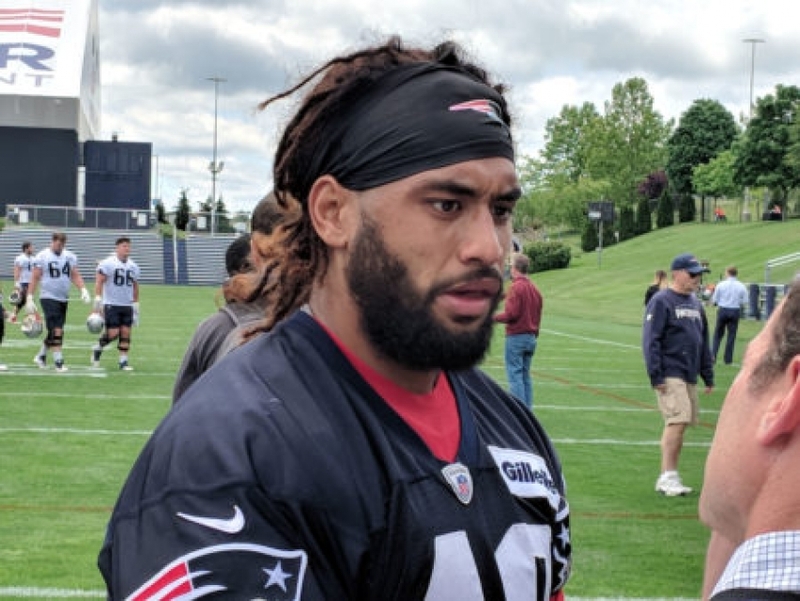 On the flip side of the coin, the surprise for the defense may be DE Deatrich Wise. 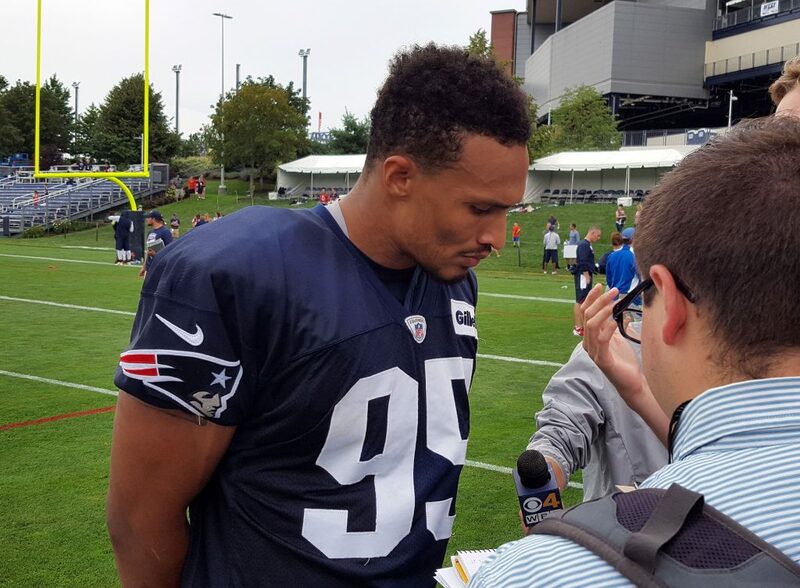 The Patriots drafted a couple of edge players in Derek Rivers and Deatrich Wise in the 2017 NFL Draft and both are expected to produce in the future but Wise may be pushing the envelope a bit earlier than expected. The rookie who has a large wingspan at 6’5, 271 pounds and seems much more mature than his years may just be a steal in the 4th round of the draft. After a stellar junior season in 2015, Wise’s senior campaign was a frustrating one filled with a couple of injuries that limited his production. But as we said in the spring, if you want to see what he can do watch the 2015 tape. So far, the big man is playing both inside and outside and has shown the ability to not only set the edge in the running game but beat the offensive linemen using a nice array of moves. He’s shown good explosion off the line. Wise credits the veterans on the team for helping him with the many questions and tips for him and the other young players on the team. Can he continue to do so? He’ll be a key player to watch during the joint practices with the Jaguars and even more so once the preseason games begin. 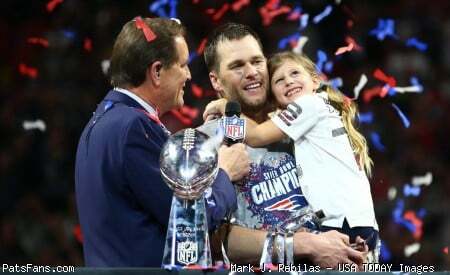 Hard to believe that the Patriots quarterback just turned 40 on Thursday. It is safe to say that no one is better prepared than Brady is and his work ethic despite his many accolades is second to none. 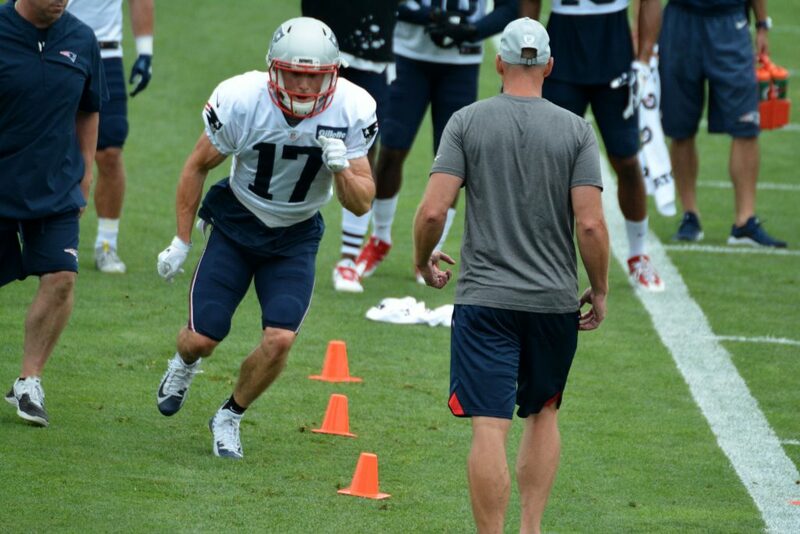 One of the things that all of the new players on the roster marvel about is how hard Brady prepares and works during practice. When he’s off the field, rarely does he sit on the side and chat with the other players. He’s usually working on his mechanics or his chemistry with some of the other players. 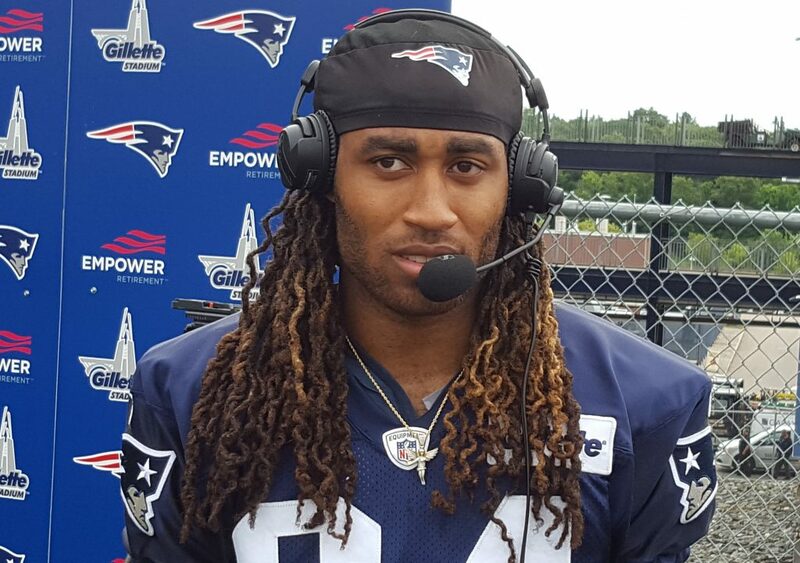 Much was made about the shoving and wrestling match between Julian Edelman and Stephon Gilmore early this week but in reality, those things happen in every training camp. 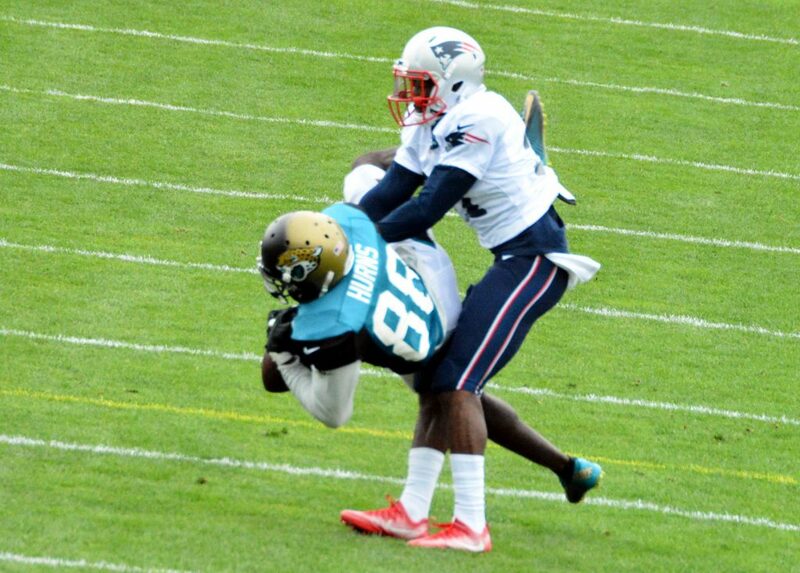 And in true Belichick form, both players were ejected from practice. The coach has zero tolerance for that and while he understands that it happens, the players know he won’t tolerate it. The heat and humidity and the constantly going against the same people will cut tempers a bit short and all it takes for one player to give another a little extra push or feel like the other guy is holding on a bit too tight and that’s it. 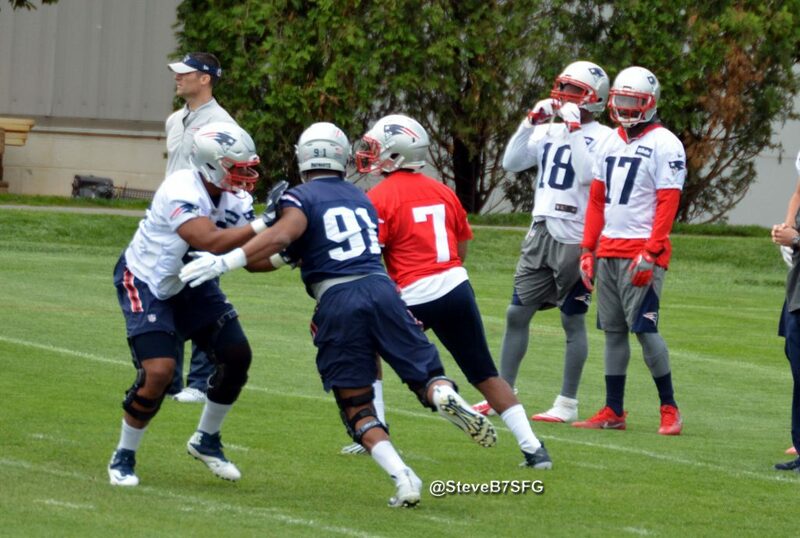 Last year both Malcolm Butler and Bryan Stork were given five for fighting and sent to the showers. 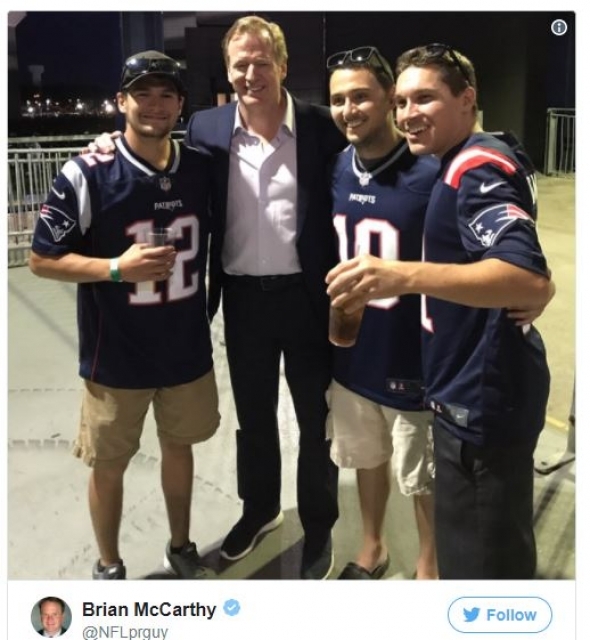 Let’s hope that we don’t see any more of it with the Jaguars are in town. But if it does it wouldn’t be shocking. 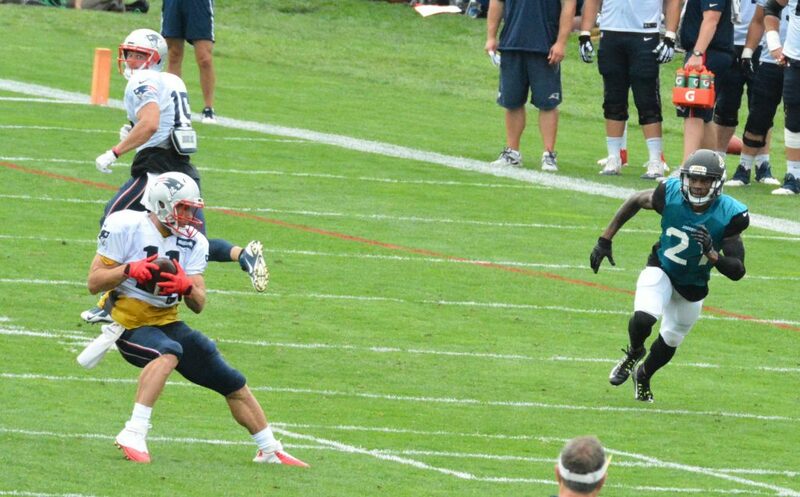 After practice on Tuesday, wide receiver Brandin Cooks spoke with the media and said that it is just training camp. The Buffalo Bills practiced in New Era Field on Friday but lost two of their defensive ends early in the session. Shaq Lawson tweaked his groin and was shut down for precautionary reasons. Lawson later reported to the media that it was nothing serious. Fellow DE Ryan Davis suffered a concussion and was helped off the field. Neither is expected to be sidelined long and Lawson may even practice today. Charles Clay had his best day of camp on Friday night and he reportedly is looking completely healthy. With the Bills still searching for WR help for QB Tyrod Taylor, having a productive season for Clay is essential. While it is still early in training camp, Taylor has looked very inconsistent according to the Buffalo media. Having Clay heat up would certainly help that. The Miami Dolphins had pretty high hopes for the 2017 season after a 10-6 campaign last year and a playoff berth. But then a non-contact injury to starting QB Ryan Tannehill is the nightmare no team wants to face. But when faced with a similar situation during the stretch run in 2016, the team rallied behind Matt Moore to win three of four to secure a playoff spot. With Tannehill possibly looking at season-ending surgery, Moore is the man for now. And forget the haters, Moore is a very solid backup QB. 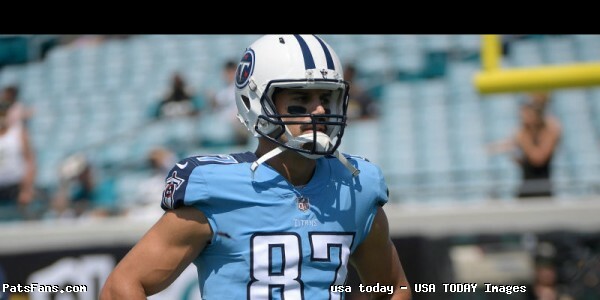 Is he the answer for the Miami Dolphins for this year? They have reached out to Jay Cutler to see if he’s interested. If he’s signed, I would be surprised if Adam Gase just handed the job to him. Especially the way Moore rallied the Fins last season. Don’t count them out yet. Miami dropped four of their first five and rallied. Then regrouped again after Tannehill went down last year. Gase has his work cut out for him, that is clear. But as we pointed out a year ago, Miami hired the right guy this time. The New York Jets have their first week of training camp in the books and there is no QB controversy this season. According to reports by the Jets media beat writers, Josh McCown is getting nearly all of the first team reps. One piece in the New York Post said the number was almost 99 percent. Christian Hackenberg is solidly locked into the 2nd team slot. Bryce Petty? In the same report, he was reported to get only four reps total during Friday’s session. McCown certainly has his work cut out for him. Only Quincy Enunwa is a bona fide NFL wide receiver with any kind of experience. The Post reported that the Jets WRs are running the wrong routes and making all of the QBs look bad. The good news for Gang Green is the play of their top draft picks Marcus Maye and Jamal Adams. Both are having solid camps and appear to be the starting safety tandem for the Jets when the season opens. 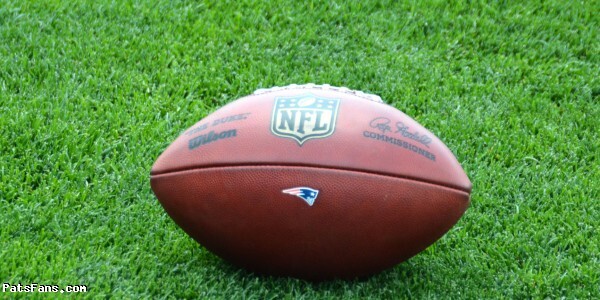 This entry was posted in NFL Commentary, Patriots Commentary, Patriots News, Patriots Video and tagged 53 Man Roster Projection, Bill Belichick, Buffalo Bills, Chris Hogan, Danny Amendola, Dion Lewis, Dont'a Hightower, James White, Jimmy Garoppolo, Julian Edelman, Malcolm Butler, Miami Dolphins, New England Patriots, New York Jets, NFL, Patriots, Patriots edge rushers, Patriots Training Camp Photos, Rob Gronkowski, Tom Brady, Trey Flowers on August 6, 2017 by Steve Balestrieri. The Patriots wrapped up their seventh practice of the 2017 training camp and their fifth practice in full pads in a row. The crowd was a bit bigger than the past few days probably because it happened to be Tom Brady’s 40th birthday and he was serenaded by the fans near the end of practice. 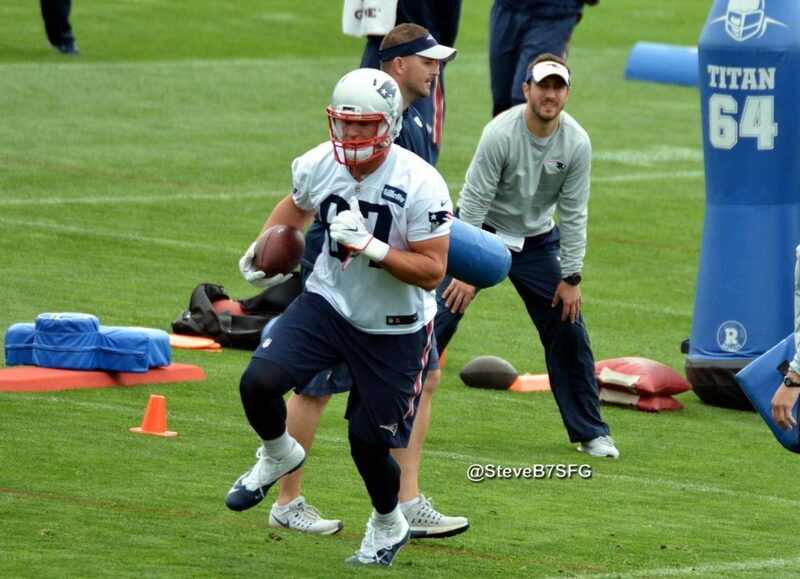 But if you went today, expecting to see a large dose of Brady, then you were disappointed. After the first few minutes of practice, Brady and nearly all of the first team offensive players retreated to the lower practice fields accompanied by the starting secondary players as well. And there they remained until the practice was nearly over. Not much could be seen because the storage building outside the practice field was blocking the view. But what little could be seen was that the offensive linemen were pushing the sleds a few times and the rest seemed to be just standing around.Therefore, this was a day for the backups to the lion’s share of the snaps today. Bill Belichick said in his morning presser that the many players being dinged up have hurt the team’s preparation. Perhaps he felt that the backups weren’t progressing well enough and wanted to get them all the work. Regardless, it was the first time I’ve seen this in the last ten years. 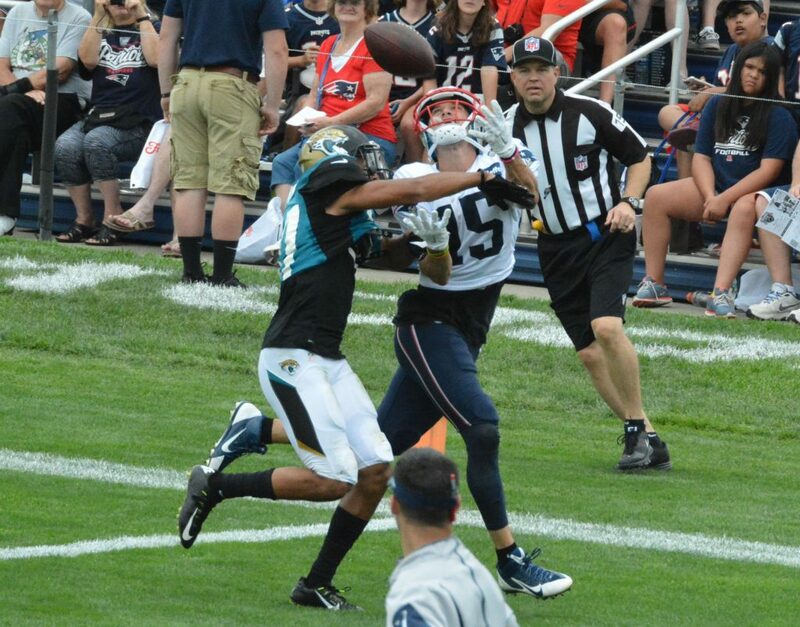 Josh McDaniels went down to the lower fields and WR coach Chad O’Shea called the plays. 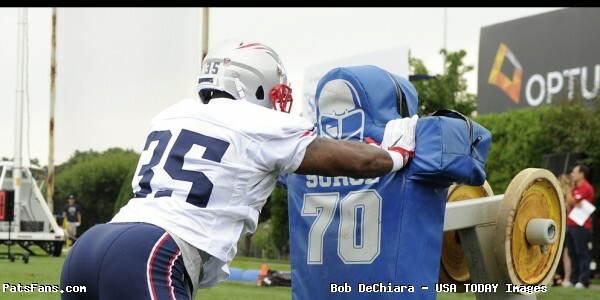 No Shows: Alan Branch, Dont’a Hightower (PUP) and Andrew Jelks (NFI) didn’t practice but were in sweats on the sidelines. 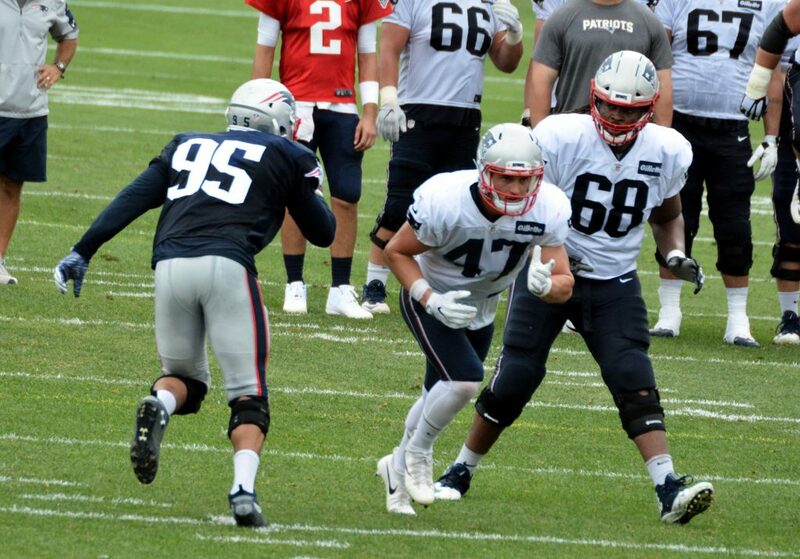 Cody Hollister, Nate Solder, and Matt O’Shaughnessy weren’t seen. David Jones, Mike Gillislee, Chris Hogan, Malcolm Mitchell and Danny Amendola retreated to the lower fields for work with the training staff. D.J. Foster had a concentration drop early in practice but had a very solid day both receiving and running the ball. Both the offense and the defense (Substitution issue) had to take a penalty lap today. Kony Ealy had to take one on his own. Brissett then made another nice throw to Devin Lucien on a short comeback route, where he drilled the ball exactly on-time and on-target. 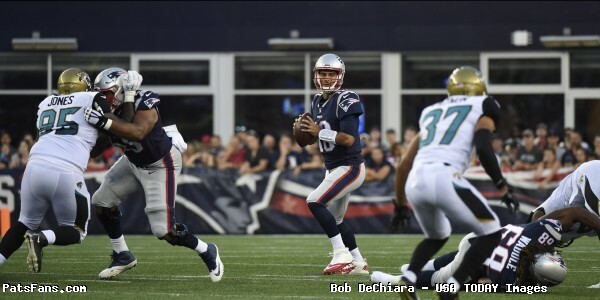 Jimmy Garoppolo made a pair of nice deep throws to Lucien and Tony Washington. Garoppolo had an interception where it looked like the ball was tipped at the line of scrimmage and was picked off on a nice head’s up play by Cyrus Jones. 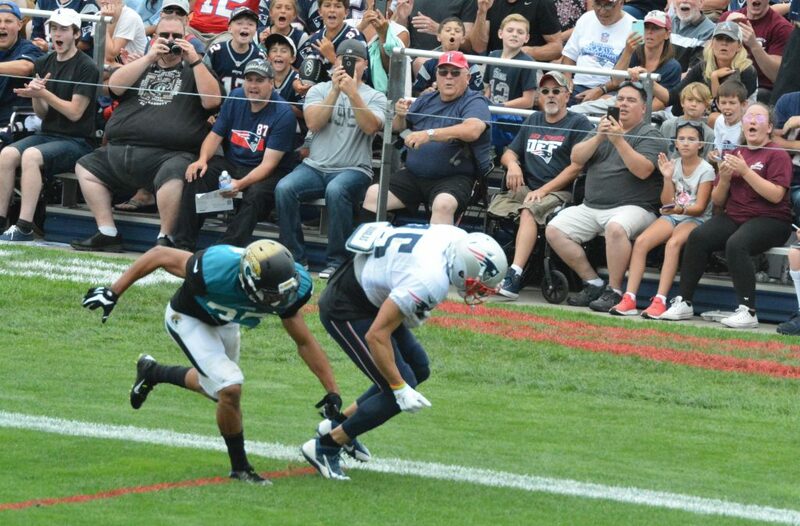 Eric Rowe was getting first dibs in the slot today. 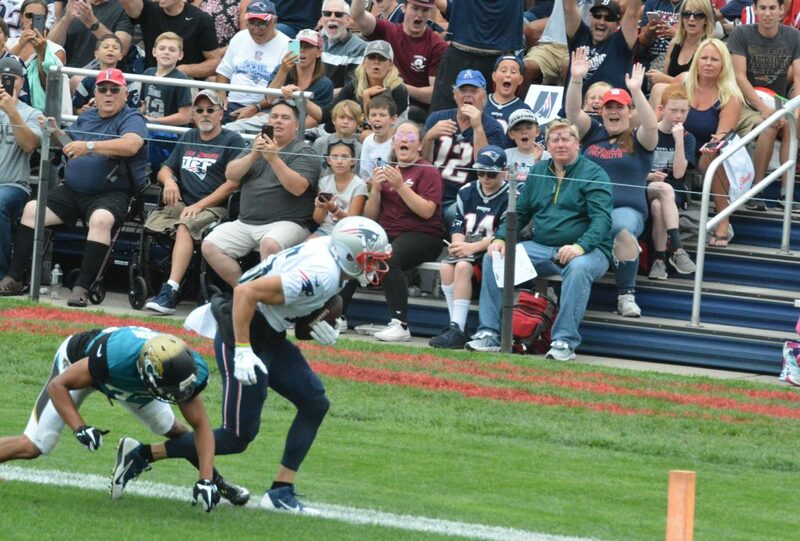 Austin Carr had a really nice catch on a deep sideline ball thrown by Jimmy G. over Jonathan Jones. Jones went down awkwardly but returned to finish practice. 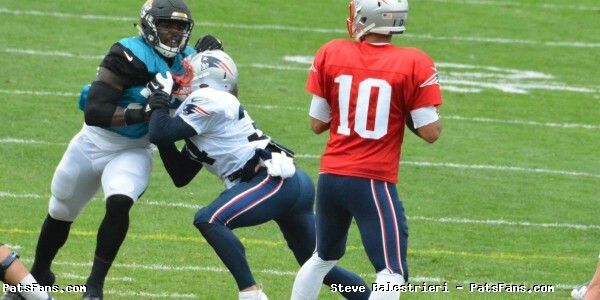 Stephen Gostkowski had a strong day. He was booming field goals from 45+ yards with plenty to spare. Derek Rivers showed a nice job of setting the edge, defeating the block of Matt Lengel and stopped Foster behind the line after making him reverse his field. Geneo Grissom beat Max Rich with a speed move to the outside. Rich then turned the tables on Grissom later and stoned the big DE cold. James Ferentz stoned Woodrow Hamilton in another good battle of big men. Play of the Day: Jacob Hollister burned Jordan Richards on a deep post for a 30-yard touchdown pass from Jimmy G. The young tight end has some intriguing speed. 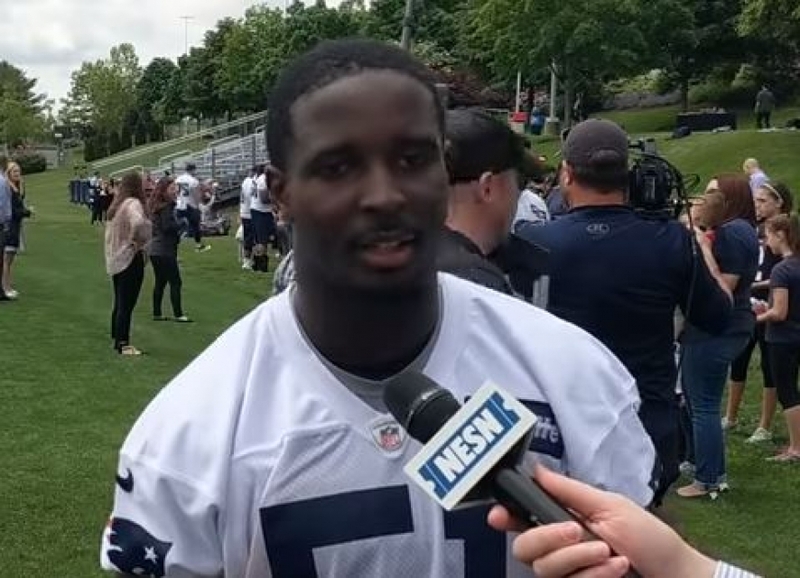 After practice, Devin McCourty addressed the media with his young baby in his arms. 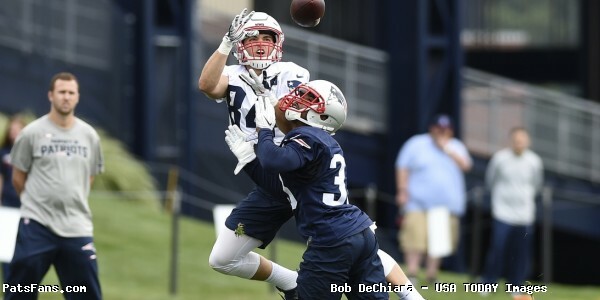 This entry was posted in Patriots Commentary, Patriots News and tagged Bill Belichick, Chris Hogan, Danny Amendola, Dion Lewis, Dont'a Hightower, New England Patriots, NFL, Patriots, Patriots edge rushers, Patriots Training Camp Photos, Rob Gronkowski, Tom Brady, Trey Flowers on August 3, 2017 by Steve Balestrieri. Football is back! The Patriots took to the field for the first time in pads in 2017 (albeit in shorts and shells) for their first training camp practice of 2017. Temps were cooler than expected and the sky was overcast. The crowd was huge and raucous, any activity at all by Tom Brady or Rob Gronkowski was immediate grounds for a huge cheer as the fans are excited to see the Super Bowl champs back on the field. Speaking of Gronkowski, the big man looks as healthy as can be, he was moving very well all over the field and before practice, Bill Belichick was asked about Gronkowski’s health and if he was going to a be a full-go at practice. Belichick responded that those questions were answered in the spring and Gronkowski had no limitations on his practicing. 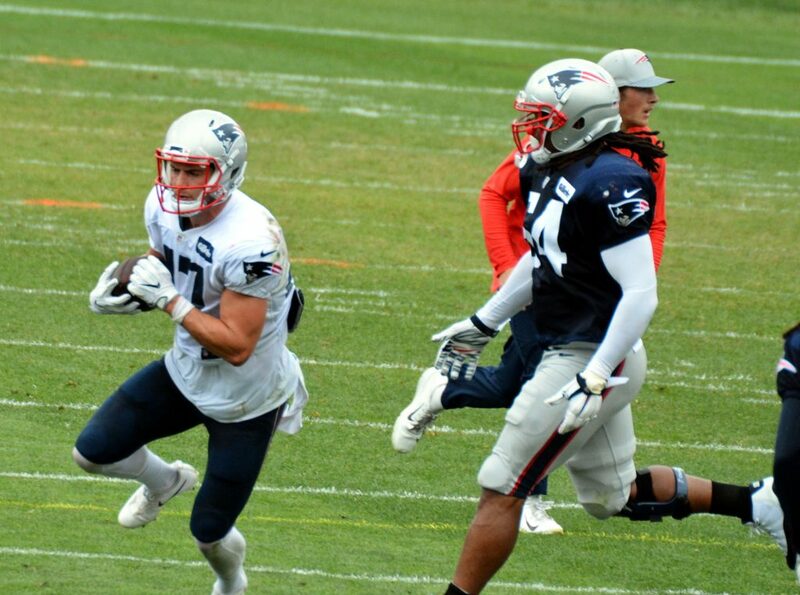 Team Healthy: Another very good sign, health-wise was concerning Dion Lewis. Now about 18 months removed from his surgery for a torn ACL, Lewis looked like the lightning-quick back with excellent cuts that we’ve become accustomed to. The Patriots called his number frequently out of the backfield and he passed the first test. The only concern with him or Gronkowski for that matter would be if their injuries acted up after a full day of practice. 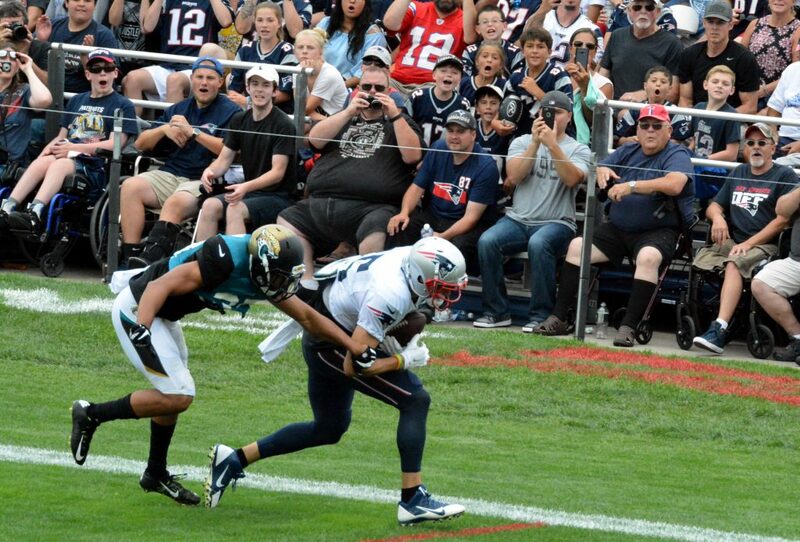 One notable absence was Rob Ninkovich. The intensity level was toned down with just shorts and shells, so there wasn’t the hitting that one would be expecting on the first day of camp. 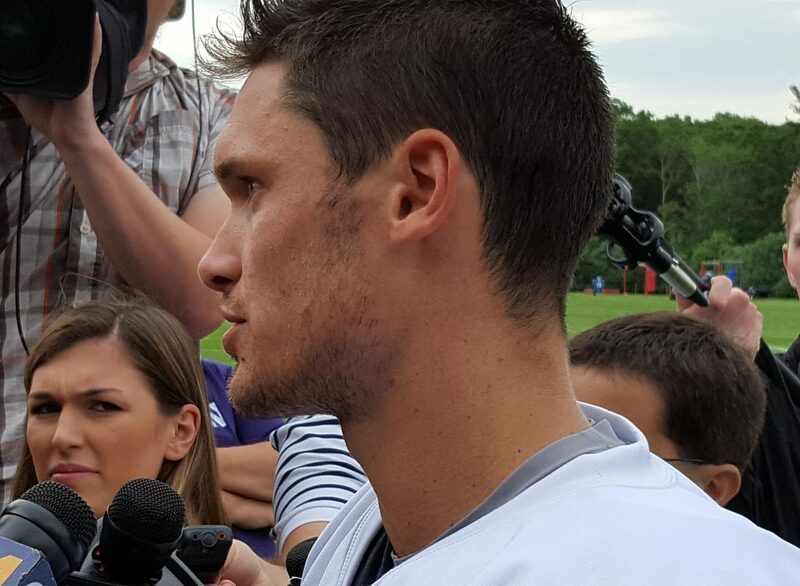 So it was kind of like an intense version of mini-camp as the hitting was toned down a bit. 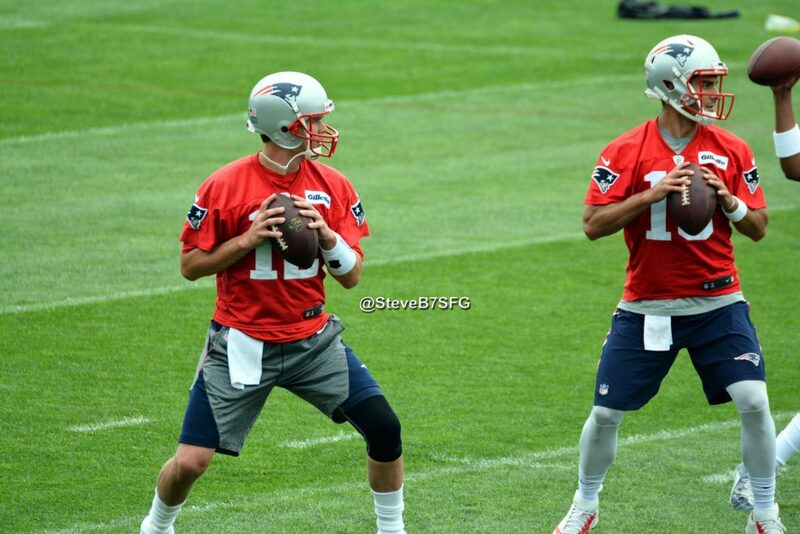 Brady – Jimmy G. Split Reps: Interesting to note, that although Tom Brady took all the “first team” reps (since BB hates to use that term in training camp), he and Jimmy G. split reps pretty evenly. Normally Brady takes a lion’s share of the reps with Garoppolo and Jacoby Brissett to get what they can. Brady looked sharp and on target, he overthrew Brandin Cooks on one deep throw in drills, but looked in control and in near mid-season form. Garoppolo had a mixed day, he gets the ball out quickly and for the most part was pretty accurate with his throws, he threw a dart to Chris Hogan in the back corner of the end zone with Justin Coleman in coverage. 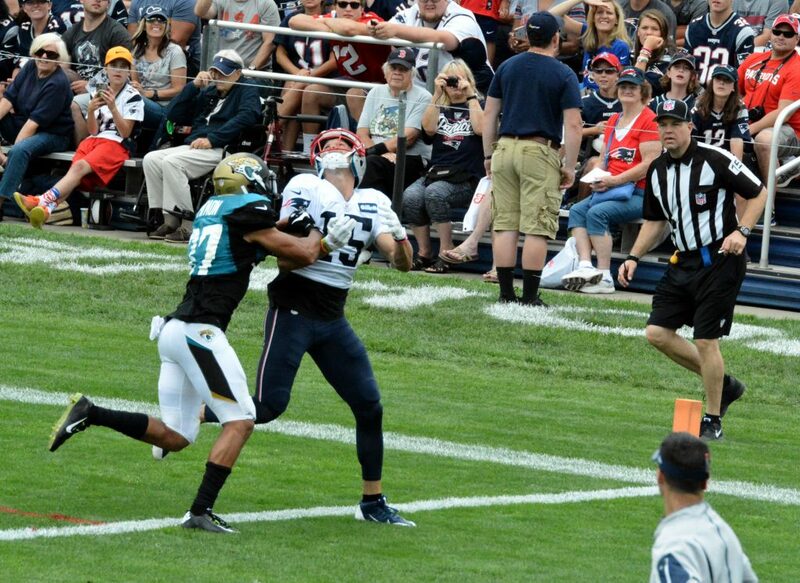 And then did the same thing on a nice grab by Cody Hollister. But he had some bad misses too…First day of camp norms. Brissett still holds the ball too long. 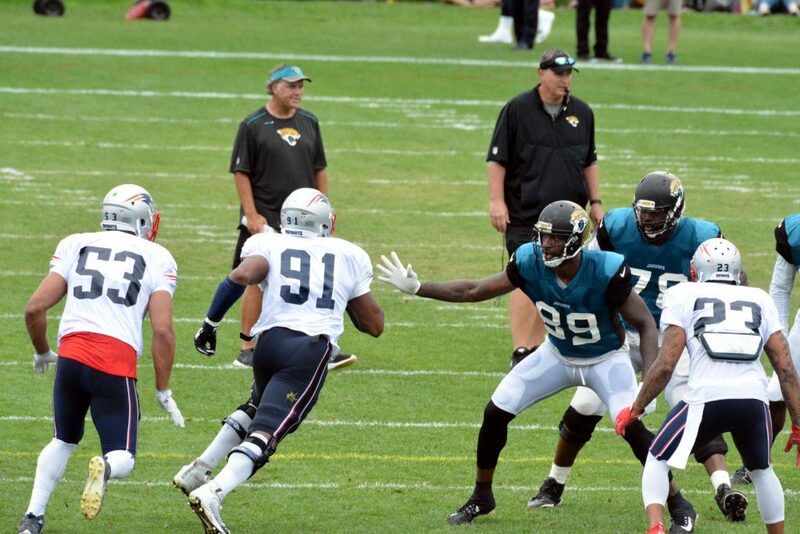 Time after time during drills, he wasn’t making the reads quick enough and wouldn’t even make a throw. His accuracy was better but still needs work. He has an incredibly strong arm and can make all the throws, but needs to work on his consistency. He got a lot of work today as well. 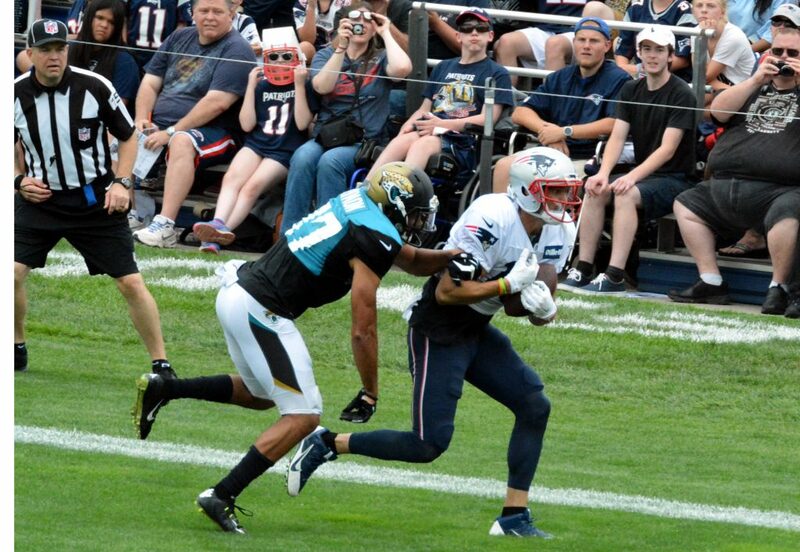 His best play was a nice throw and grab at the back of the end to Devin Lucien during 11s. 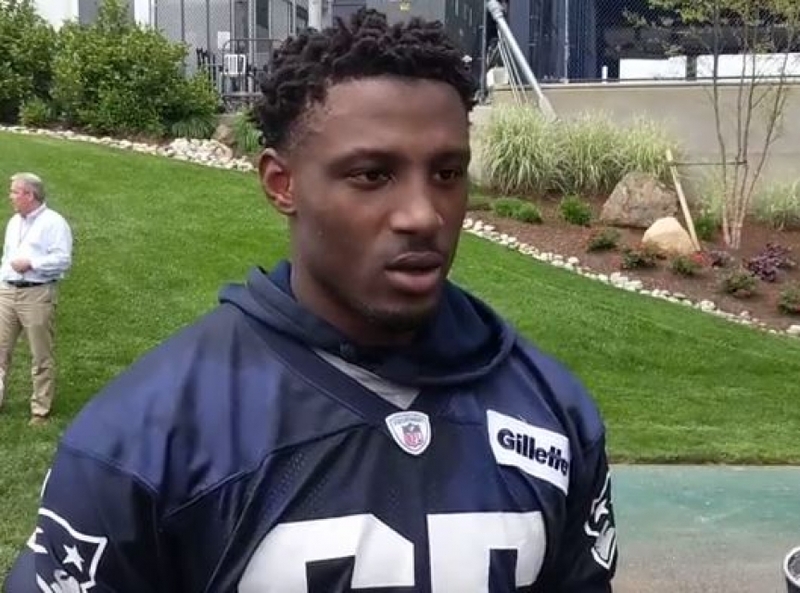 Dion Lewis and Cyrus Jones took most of the first reps with the return units, Danny Amendola also took some reps. Both Jones and Lewis looked good with good speed heading down the lane and each fielded the ball cleanly. 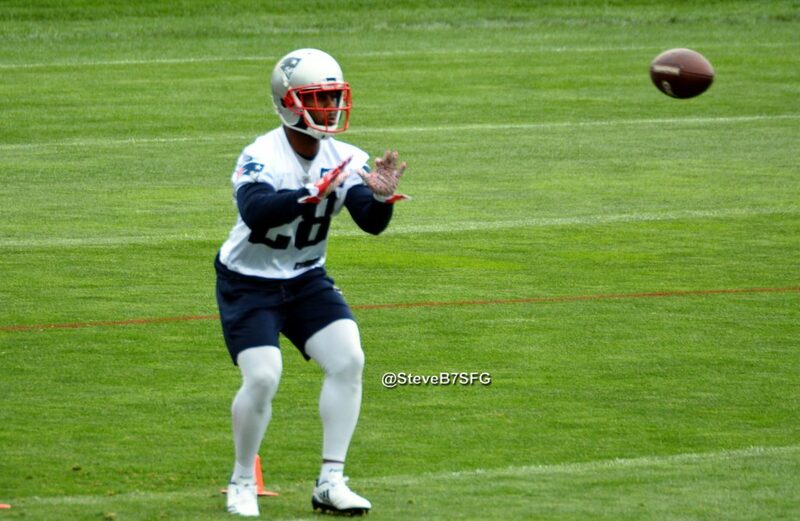 Tony Garcia got some one-on-one work with STs coach Joe Judge working on the punt return unit along with Ted Karras. 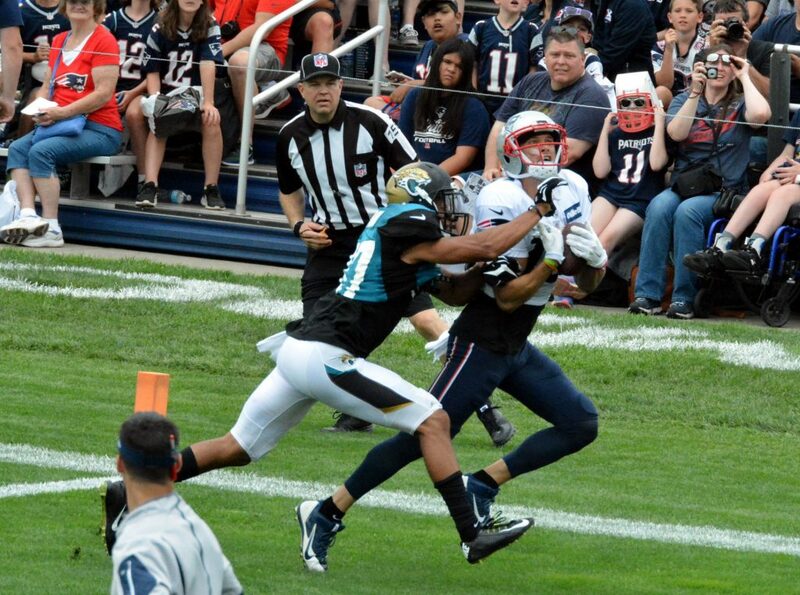 Other observations: This Patriots offense looks like it is going to be tough to stop. Spreading the field wide they can work underneath with Cooks and Edelman and the cushion they create is going to make it easy to move the chains. 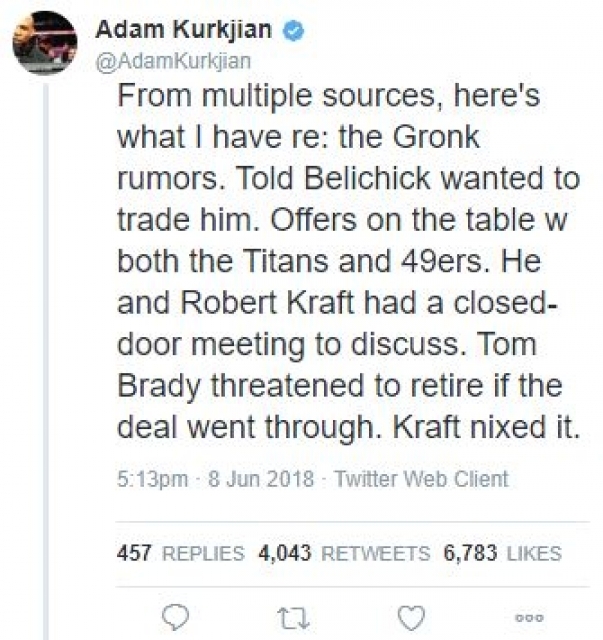 They can also flex Lewis or Burkhead out of the backfield, forcing the defense to cover with a linebacker and when they do this, the mismatches they force will be easily identified. The running game had a quiet day as the team was just in shells so I wouldn’t read much into that. Austin Carr had a nice morning, he was moving around well with the backups, working with Brissett and speaking with him afterward, he seems like a very well grounded young player. Players meeting with the media after practice included Julian Edelman, Gronk, David Harris, Malcolm Butler, Stephon Gilmore, Derek Rivers, Chris Hogan, James White, Carr, and others. 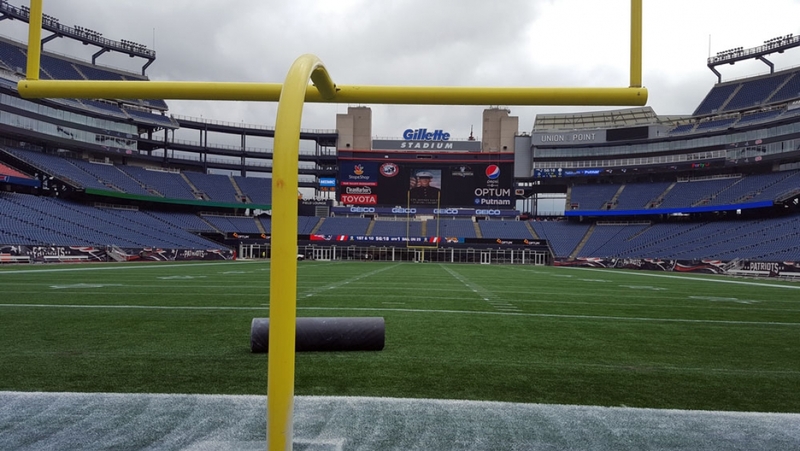 Check back with PatsFans.com later and we’ll have some video interviews. 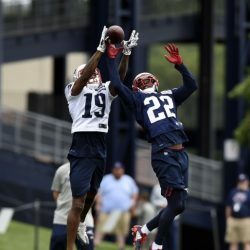 This entry was posted in NFL Commentary, Patriots Commentary and tagged 53 Man Roster Projection, Bill Belichick, Chris Hogan, Danny Amendola, Dion Lewis, Jabaal Sheard, Julian Edelman, New England Patriots, Patriots edge rushers, Patriots Training Camp Photos, Rob Gronkowski, Tom Brady on July 27, 2017 by Steve Balestrieri.